Citrus fruits have been part of the human diet since ancient times. Pomelos are very large and native to Malaysia. Pomelos are one of the largest citrus fruits and are related to grapefruits. In fact, these citrus fruits are thought to be the parent of the grapefruit. Legend has it that pomelos were dropped on Jamaican land by seagulls traveling from the island of Barbados where the fruit was brought by a Captain who worked for one of he East Indian trading companies. Pomelos have thick skin which is light green but turns yellow when ripe. The inside of this fruit is a coral pink when ripe and ready to enjoy. 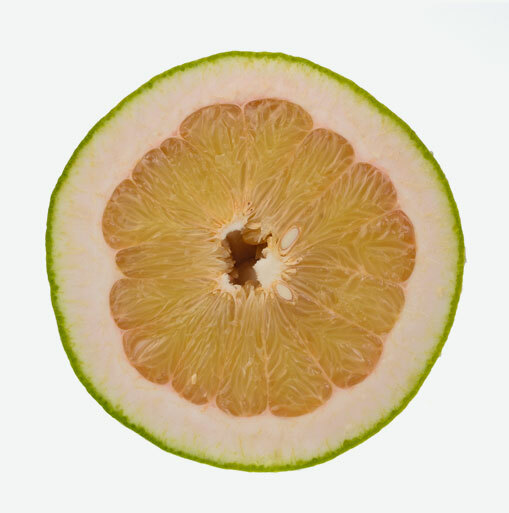 The flesh can be light yellow to coral pink and taste much like a grapefruit. Like grapefruit, check with your pharmacist if you are on medications such as blood pressure medicine or heart medicine before eating pomelos. Pomelos provide a great source of potassium and vitamin C. Both nutrients are important in maintaining cardiovascular health and fluid balance for the body. Choose pomelos that feel heavy for their size and are free of bruises or blemishes. Use the flesh as you would grapefruit. Peel or halve and section. Pomelos ripen in winter, as do many other citrus fruits and therefore are best refrigerated. Store pomelos up to one week in the refrigerator. Enjoy the sweet taste of pomelos in salads, desserts or eaten fresh as a snack. Grab a pomelo and peel it and then section it into a salad or turn it into dessert with some pineapple and raspberries and a dollop of vanilla yogurt.